Believe it or not, I actually looked forward to clocking into work. When April of my senior year of high school rolled around, it was time to start looking for a summer job. My best friend came over to my house, laptop in hand, ready to find us summer jobs that would cause us the least amount of suffering. We submitted at least five applications each, but I had my hopes on a particular place even though I had no idea what it really entailed. Shortly after, I was contacted and scheduled for an interview. 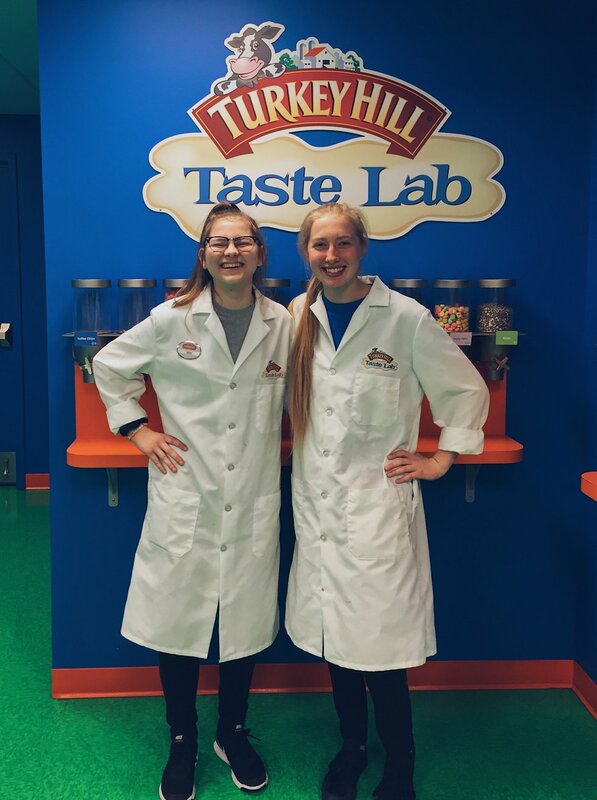 I went in, interviewed for a position, and in no time, I was working at the Turkey Hill Experience in Columbia, Pennsylvania as a taste lab instructor. Little did I know, this would be the best decision I ever made. 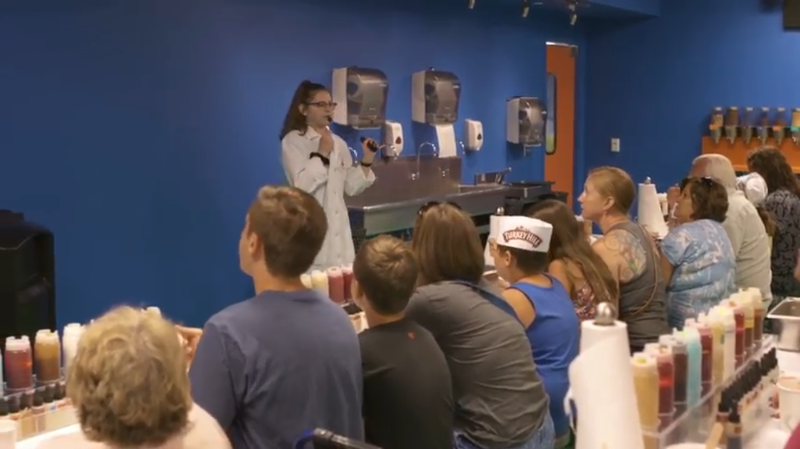 I know the title "Taste Lab Instructor" is probably very confusing for those that have no idea what the Turkey Hill Experience is, so let me enlighten you. In simple terms, this position requires teaching multiple labs a day where guests make their very own ice cream creations, as well as, another lab for sampling teas. When I was first told that I would have to learn two scripts, I immediately regretted taking this job. I was never in my school's plays and never had to memorize lengthy scripts, which left me with no background in presenting without an index card. When I initially received the scripts, I was convinced I couldn't do this job. There were pages and pages of instructions and facts that I had to hammer into my head. I am naturally an introverted person; I like to keep to myself most of the time. I also don't have the highest level of confidence in myself, so me and this job made absolutely no sense together. However, I wanted a challenge, (I also couldn't turn down the lab coat I got to wear every day). Even though this job required a lot of other skills, such as time management and working on a team, my mind was preoccupied with teaching a group of 80 people of all ages for 45 minutes. However, my perspective changed after my first day of work. That was when I knew I made the right decision. That day I connected with so many new people. My trainer, Jean, helped me learn all I needed to know and reassured me many times that I would be great at teaching (thank you for the confidence boost, Jean, I truly needed it!) The first lab I ever taught was rough, but I got through it. When I finished the last slide, I went to open the door and a round of applause erupted. Seeing all the smiling faces of the group I just taught, provided me with the spark I needed to enjoy my next three months of the job. Not only did I come to love presenting and connecting with guests every day, but I cherished the people I worked with. You would think spending eight hours a day with a majority of the same people would get boring, but I can assure you there was never a dull moment. From writing quotes on the whiteboard in the kitchen to listening to each other's music while we cleaned, I loved spending time with my coworkers. Everybody there flooded me with warm welcomes and guided me at the beginning of my first job. I made best friends in a matter of three short months that brought out the extrovert hidden inside me. I created so many new friendships at the Turkey Hill Experience, and I am forever grateful for all these connections. While I was getting ready to leave for college, I was heartbroken because of all the people I had to leave behind. I swear I was more sad about leaving the Turkey Hill Experience than leaving behind my own house. My friends/coworkers shaped me into the person I am today, and I am extremely thankful for the confidence and extroverted nature they gave me. I can't even imagine my life without this incredible experience. My transition to college was made easier because of what I learned at my job, and I don't think many people can say the same thing. So special shout out to my all my friends at THE: I am extremely grateful for the countless ways you've helped me grow. P.S. Sorry I'm vegan and couldn't even eat the ice cream. One of the most important things you can gain from an internship is growth through these eight essential takeaways. This summer I had the exciting opportunity of completing a semester-long internship. I've completed a few different internships in the past, but this was my first full summer interning at a hands-on company. No matter where you're working, being an intern is an experience unlike any other. It's not a part-time job that you get just to pay the bills, and it's not an experience which will be useless to you; internships are vital to not only building your resume but also growing as a student. 1. Make meaningful relationships with not only the employees, but also your fellow interns. Networking is one of the most important things to indulge in, especially at the young age of a student intern. The people you work with and for will be important connections to hold on to as you start applying to entry-level jobs post-college, so make sure to say hi's and bye's at the beginning and end of the day, and have conversations with those around you - those simple actions are the foundation of meaningful connections. 2. Take notes on your progress, the work you do, and things that you like and don’t like. Every day, I wrote down the tasks I worked on, and every now and then I would write a little entry for my own records, taking note on how I was feeling about the work that I was doing and the progress that I was making. Whether it's for the future job interview you'll be preparing for or for the sake of your personal memory, having the details of your internship written down will benefit you down the line. 3. Don’t be afraid to ask your supervisor questions or ask for help. Having an open line of communication with your superiors is absolutely vital if you want to establish a strong relationship. As well, you should feel comfortable asking for pointers, especially if you aren't understanding what you should be doing. 4. Learn how to communicate professionally with everyone you work with. The ability to communicate in a mature and professional way is impressive, especially if you are able to reciprocate the communication around you; learn from and adapt to the environment which you are immersed in. 5. Ask for constructive criticism and grow from it. On top of open and mature communication, learning from constructive criticism is so important to the growth in your internship and professional career and you should not be afraid of hearing how you can do better. 6. Work hard and efficiently, no matter what your task is. Sometimes, you get to work a few minutes late on a rainy Monday with no coffee in hand and you just are not in the mood to do anything, let alone be productive. On that day and during those seemingly insignificant tasks that you were assigned, remember the bigger picture. Remember to work hard, because you earned this internship and with every day and every task you are in that position, you are investing in your future. 7. Be independent in your work. It doesn't matter if you are one of five or thirty interns, you should be able to confidently produce your own, original finished products. Asking for other opinions and perspectives is great, but remember that you were hired because of who you are. 8.You are of way more importance than you think. The most important takeaway is that you are an asset to the company and employers that you are interning for, and that that should not be left without personal recognition. Odds are, your supervisor is going to be endlessly grateful for all of the assistance and work you provided, especially if they see that you enjoyed working there, worked hard, and grew throughout the process. I'm the biggest proponent about getting out of your comfort zone, experiencing new places and people, and constantly aiming to learn new things and that's exactly what an internship provides you! So don't be afraid to make mistakes and grow out of your comfort zone during this important experience, but the most important part is to reflect on your internship and understand all of the things that you have gained throughout the process.